Pundit Tarun Bhattacharya, maestro of the ancient santoor string instrument and on tour from India, and New York-based vocalist Shri Anurag Harsh gave a concert in downtown Raleigh on Saturday, September 29, 2007. 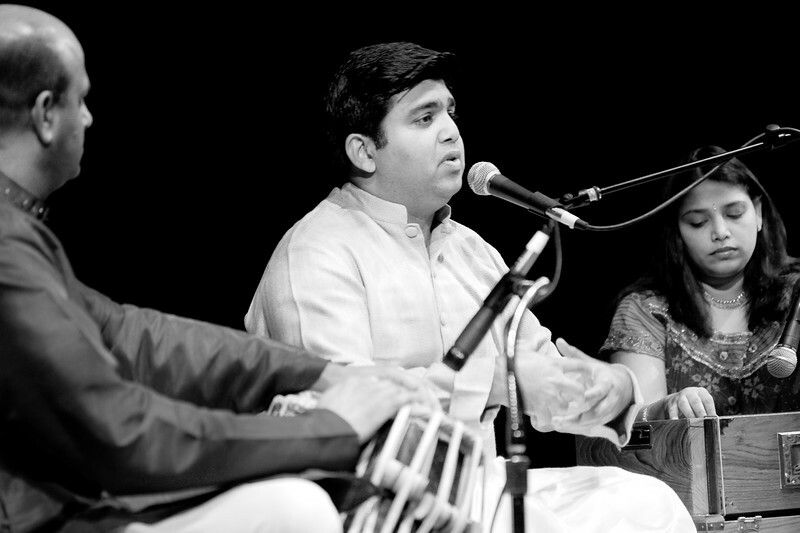 They performed accompanied by locally-based Shri Nikhil Tikekar on tabla and Richmond-based Chirashree Bhattacharya on harmonium. Vibrant Memories Photography was proud to be one of the sponsors! You can read the article written the night before in the local Raleigh News and Observer newspaper. All photographs, except pamphlet front and reverse, here copyright ©2007 by Dilip Barman of Vibrant Memories Photography. All rights reserved. Permission is granted for noncommercial usage, including downloading and printing. Pamphlet front and reverse images provided by Shri Anurag Harsh and posted with his permission.